Timentin™ is a 15:1 mixture of ticarcillin and clavulanate. Ticarcillin is a penicillin ß-lactam antibiotic, which is susceptible to ß-lactamase degradation. When combined with clavulanate, a ß-lactamase inhibitor, its efficacy is greatly increased. Timentin™ exhibits high activity against gram-negative bacteria and resistant Agrobacterium species. The TimentinTM EZ PakTM is the fastest and easiest way to make a set amount of sterile TimentinTM solution. The kit includes pre weighed TimentinTM powder, a sterile filter, and a sterile container for the filtered solution. No need to calculate, simply add the stated amount of deionized H₂O, filter, and pour into the labeled bottle for easy usage. 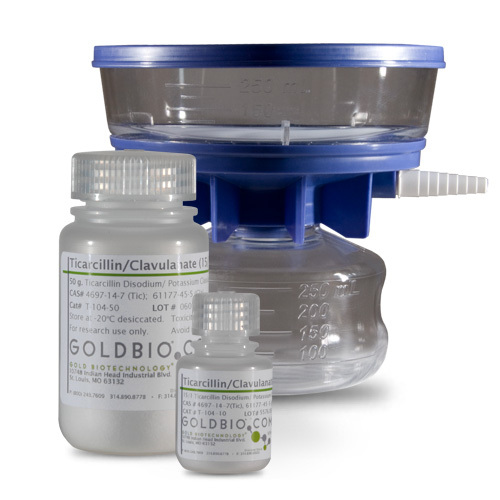 The EZ PakTM includes high quality GoldBio TimentinTM and the sterile solution is ready for tissue culture, bacterial media, or any number of uses. The 50 ml and 100 ml packs include a vacuum manifold for easy vacuum filtering while 10 ml pack size comes with syringe filter. EZ-Pak Protocol for Reconstitution and Filtration of Timentin™.